Some days, Marilyn Goske, MD, a radiologist at Cincinnati Children’s Hospital Medical Center, spends much of her time consulting with referring physicians instead of performing studies or reading exams. Even though it means her colleagues may have to temporarily pick up the slack, she would rather make certain no child is unnecessarily exposed to even low levels of radiation via an unnecessary imaging exam. Ionizing radiation at high doses, above those typically used in medical imaging, is a known carcinogen to which children are particularly vulnerable, Goske notes. “For this reason, it is vital for radiologists to ensure that the lowest dose of radiation necessary for an imaging exam to answer the referring doctor’s questions is used,” she says. Goske sees her input on exam appropriateness as an important part of her job as a radiologist at a pediatric hospital. “I think the radiologist must play a role as a consultant to work with the referring physician on a patient-by-patient basis as to whether or not the test should be done and, if so, if it’s the most appropriate test for the questions being asked,” she says. Radiologists “want to do the right thing for every patient,” according to Goske, who believes more of her colleagues share her sentiments, especially since January 2008, when the Alliance for Radiation Safety in Pediatric Imaging, which represents more than 70 organizations, launched its Image Gently campaign. The campaign seeks to educate physicians and the public about the potential effect of radiation exposure to which growing children particularly are vulnerable. More radiologists have become increasingly conscious about limiting dose for patients but particularly children, Goske says. The campaign has made an impact not only on radiologists and referring physicians but also on parents and families, she says. Goske, who chairs the alliance, believes the campaign’s effects are beginning to be seen. “I think we’re in the midst of a shift,” she says. “It hasn’t happened completely, but we have accomplished a moderate amount and raised awareness.” Two published studies within the last year have found that CT scans in children have leveled off and even are dropping, she notes. Donald Frush, MD, FACR, chief of the division of pediatric radiology at Duke University Medical Center in Durham, North Carolina, agrees that pediatric radiologists have become increasingly aware of the need to monitor radiation dose, especially when children undergo CT exams. Ultimately, though, physicians need to monitor not only one exam but also a child’s cumulative exam record, he says. Until fairly recently, he says the profession hasn’t done a good job, especially of the latter. Like Goske, Frush believes radiologists have a responsibility to help health care providers decide whether imaging is required and, if it is, whether CT is the right test. If it is, radiologists also must help answer whether it’s the right time to perform the exam or whether waiting is a better option. If CT is necessary, then they must “be sure the study is done right,” he says. Frush believes pediatric radiologists must be available on a case-by-case basis and must act as community educators, speaking at conferences as well as publishing articles on the appropriateness of imaging exams in children. Years ago, when a referring physician had a question about the need for a study, he or she might walk around the corner and talk to his or her colleague in radiology, Frush explains. Due to advances in technology, the radiologist likely isn’t in the next room and possibly not in the same facility. The geography can make getting consultations and decision support more complex, he says. By the same token, Frush says technology makes it possible for some questions about appropriateness to be answered electronically. As EHRs become standard, they can help physicians ordering tests to know whether the one they’re ordering is the most appropriate in this child’s case. “Decision support is being built into electronic ordering systems and implemented across the country,” he says. ACR Select, a product of the ACR, can be integrated into computerized physician order entry systems to help ensure that the appropriate test is ordered and performed, Goske notes. Also, in July 2013, she was part of a group that published the first pediatric diagnostics reference levels for abdominal CT. The guide is meant to provide target doses for facilities to use as a quality improvement tool. “We’re working on diagnostic reference levels for other parts of the body right now,” she says. Goske believes the campaign has helped to raise awareness among pediatric specialists, including surgeons and urologists. “We are now seeing articles in their scientific literature on radiation dose and radiation dose reduction,” she says. Recently invited to lecture at the pediatric surgeons annual conference, “I can tell you that pediatric surgeons are very interested in learning what we know now and the estimated risks from medical imaging in children,” she says. Parents are expressing as much concern about the radiation dose issue as medical professionals, according to Goske. For instance, the Image Gently campaign has been mentioned on numerous “mommy blogs, and we have a lot of traffic on the Image Gently website,” she says. While the campaign includes empowering parents to ask questions, “so they know the name of their child’s test and how it will help,” most tests are ordered when their child is ill, and it can be a difficult time for parents, Goske says. She has found that most parents agree to whatever diagnostic imaging tests physicians suggest, provided the parents understand why the tests are being done, have an opportunity to ask questions, and learn how the imaging test can help in their child’s care. Frush believes the onus is on the health care profession more than the parents to be sure no child is unnecessarily exposed to ionizing radiation. He says the Image Gently campaign has raised public awareness that much of medical imaging involves radiation, and radiation is a topic that needs to be discussed. However, “I’m not sure parents always understand what CT means and what questions to ask when they’re told the doctor has ordered one.” The Image Gently campaign wasn’t intended to increase people’s alarm rate or angst “but to make sure that health care providers, as well as parents, have a better understanding of what we do and how we do things,” he explains. CT manufacturers have developed products that help imagers use the lowest dose possible while still providing quality images. Duke is testing scanners equipped with software that automatically sets the lowest possible dose for the pediatric scan based on patient age and size. The operator enters the reason for the exam and the patient’s data. The machine, based on the information entered, suggests how to lower the dose and still preserve or even improve quality. “For example, it might say what you have entered can be improved upon by decreasing the kilovoltage and maintaining the tube current providing as good or better image quality,” Frush explains. “The patient’s dose will go down, and image quality will stay the same or improve. This technology delivers patient-specific and indication-specific scanning.” Recent phantom studies show that technology is promising for safer pediatric scanning, he adds. Additionally, radiologic technologists must be on board to achieve successful dose-lowering efforts among pediatric patients, the radiologists agree. For instance, both Lois Lehman, RT(R)(CT), a Dallas-based pediatric radiologic technologist with more than 45 years of experience, and Michael Odgren, BS, RPA, RT(R)(CT), a radiology practitioner assistant at Diversified Radiology of Colorado, have found effective ways to maximize low-dose practices during pediatric diagnostic and fluoroscopic studies. Lehman says the switch from film-based to digital radiology has made selecting a low radiation dose a little more complicated. “When we worked with film, an overexposure caused the image to be too dark. The technologist received instant feedback that said, ‘Don’t do that again.’ With digital radiology, it is easier to inadvertently allow the radiation dose to creep up, as an overexposed image can and will appear ideal on digital monitors,” she says. Imaging facility leaders also should request their vendors and physicists review their radiation safety practices even years after their PACS installation, Lehman says. Vendors and physicists are cooperative and knowledgeable about answering radiation dose questions and verifying that all technologists understand the exposure index numbers on a particular machine, Lehman says. • Use the lowest pulse rate possible. • Remove the antiscatter grid when imaging babies and small children. • The radiologist/radiologist assistant and technologist should pause and discuss the appropriateness of every study prior to completing it. Odgren, who is a member of the American Society of Radiologic Technologists, says it’s important to shield body parts. “Make sure you’re exposing only the area that needs to be exposed,” he says. Odgren says rarely do parents come in with no idea what’s about to happen to their child. “And technologists are pretty good at explaining what we’re going to do and the reason for it. But it does happen on occasion, and it’s worth it to take the time to reassure them and make sure the test is necessary,” he says. The FDA recently funded and approved three new pediatric fluoroscopy educational modules developed by an Image Gently campaign workgroup. The modules, which are available on the Image Gently website (www.imagegently.org), cover enhancing radiation protection in pediatric fluoroscopy, managing radiation dose during examinations, and managing radiation dose and possible tissue effects after procedures. 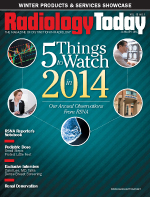 They include resources for radiologic technologists as well as radiologists and medical imaging physicists.